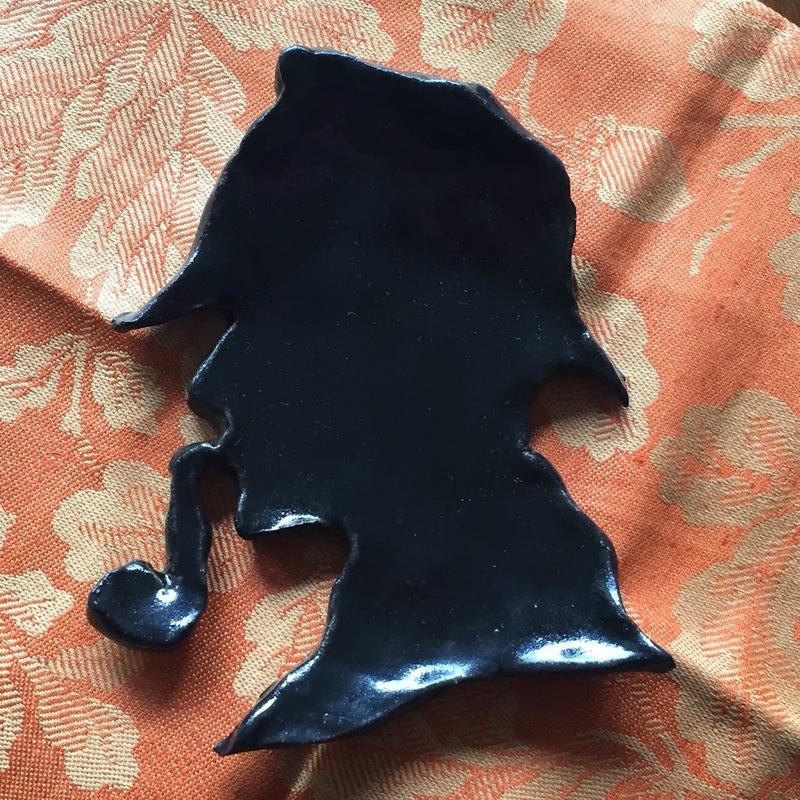 This week we're making ceramic Silhouette Sherlock plates. You read that right. The crafty gang headed for the ceramics open studio and got a little crazy. These plates are super fun. Create your template. 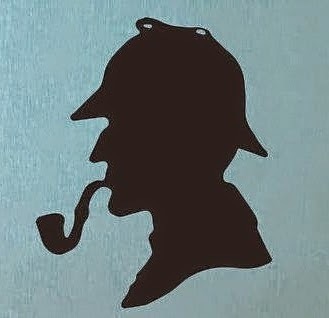 I used the Sherlock shape in the photo below and printed out and enlarged it. Once your project dries it will shrink about 10%, so make it a little larger than you want your final project to be. You may recall that we used this same shape in the glass painting project back in June. 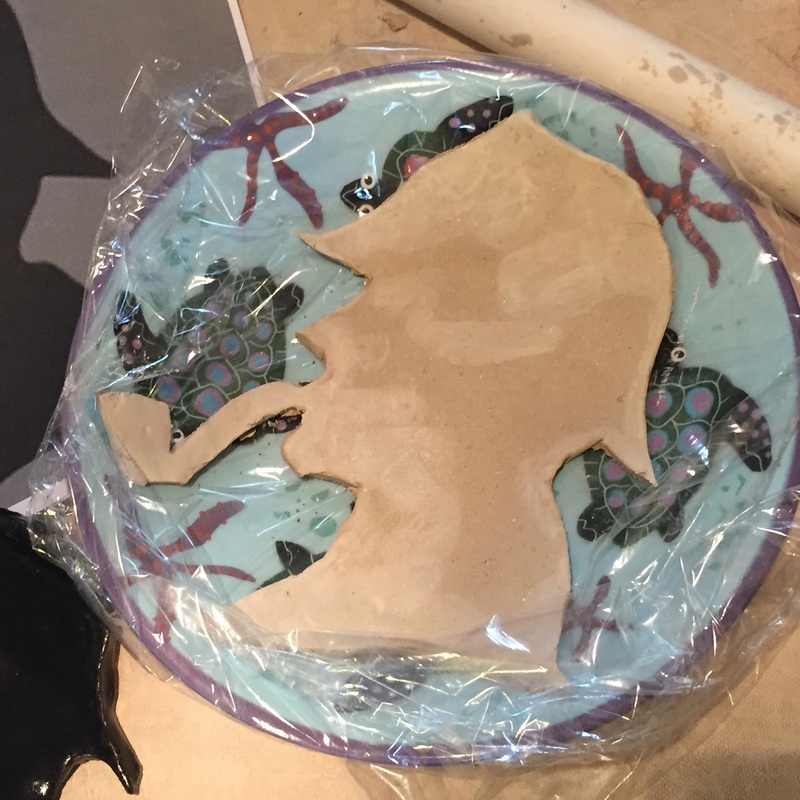 Roll out your clay and put the template on it to cut out your desired shape. 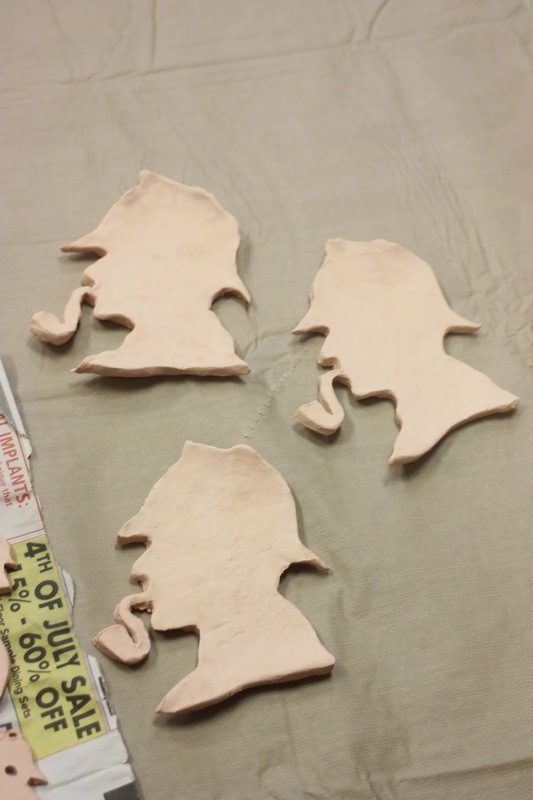 Use your pointy tool or dull knife to cut they Sherlock shape out of the clay. Smooth the edges around the Sherlock Shape. Keep in mind when you move it that the pipe is the most delicate part of the plate. We lost several Sherlocks because we weren't careful of that pipe. If you want a curved shape to help keep items on the plate, we recommend that you let in dry in a bowl covered with plastic wrap. Let your item dry and then have someone who knows how to use a kiln fire it. We cheated and let the open studio instructor, Trudi, do this part. Thank you Trudi! Apply the glaze. We used an opaque black glaze and dipped them in a vat of glaze, then sponged the glaze off the back, so it didn't melt onto the kiln. The dipping method worked well. If you don't use the dipping method, apply the glaze to the top of the plate with a paint brush. Three coats works best. Be careful that you don't over glaze the pipe. Too much glaze can cause your project to stick to the kiln. We lost another Sherlock to this problem. Fire these little guys in a kiln one more time. And you are ready to serve little items on your Sherlock plate. Sherlock plate is cool. Love the turtle plate used in the drying process.